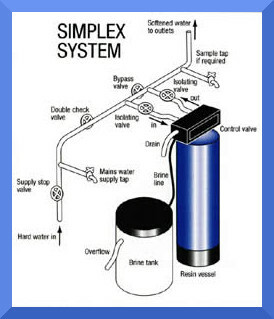 Simplex Water Softener, Term used for a single vessel system, we supply industrial softeners that regenerate on either a time controlled basis or meter controlled for where the usage will tend to vary from day to day. Typical application are where the usage per day has been calculated and will not vary hugely, whilst not being required 24 hours per day. 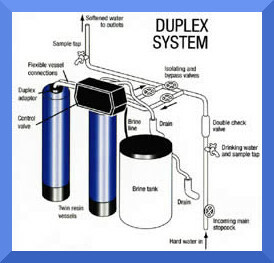 Duplex Water Softener, Term used to describe a twin vessel system as with the simplex system when the programmed volume has been reached the service unit that is exhausted goes immediately into regen and the unit that was in stand by automatically goes into service thus ensuring 24/7 soft water production. Typical applications are Hotels, Restaurants, Car Washes and where the anticipated usage is not accurate or may well increase during seasonal operations. 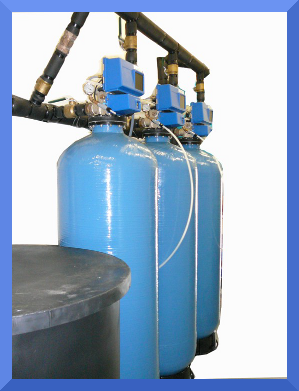 Triplex Water Softener, Term used to describe a three vessel system this will enable you to achieve high service flow rates should high peak flow rates be required. The system sensors monitors flow rates and makes two of the three units come into service should the demand require it as with a Duplex system when the programmed capacity has been reached the exhausted unit goes into regeneration, the other two continue on in service, each unit has its own individual controls so they can be programmed to run in a number of formats to suit the clients requirements. Typical applications are large hotels, leisure parks and bottling plants. This is fundamentally the same as a Triplex system, only using 4 vessels configured to suit the customers flow rate requirements. Generally only used where very high flow rates are required on a constant basis, as was the case at Ascot Racecourse when we designed built and installed this system.